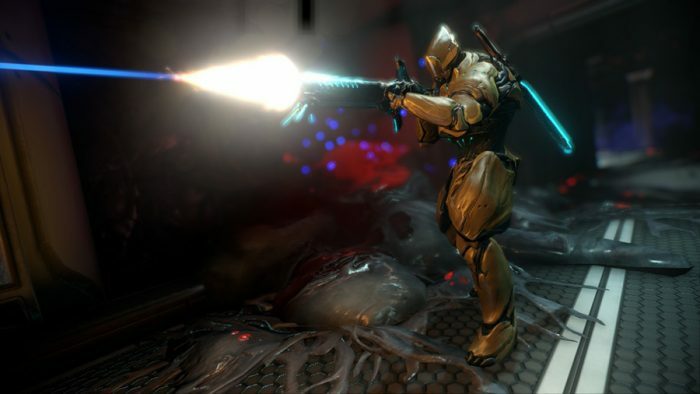 Warframe, the massive co-op Free-to-Play game, is coming to the hottest game console on the market. Nintendo may never get Destiny on the Switch, but it possibly just got something bigger. At its Tennocon expo, developer/publisher Digital Extremes revealed that the massive (and massively popular) Warframe is coming to the newest Nintendo console. The game is being ported over by Panic Button, who worked their magic on Doom, Wolfenstein II and Rocket League for the device. Warframe is a third person shooter, built around co-op, upgrading weapons and skills, and space-based combat. It’s a huge game, with millions of players worldwide already chunking across other gaming consoles and devices since 2013. Though no date has been revealed, comments on Twitter and across media give us a “soon” timeframe, whatever that means.